Sometimes I feel a bit of a slump in the afternoons, even if I’ve gotten plenty of sleep. It’s tempting to turn to something sugary or full of caffeine (like one of those decadent coffee drinks). But I’d rather do something healthy and good for my bones while getting an energy boost. With a little planning ahead, that’s absolutely possible, and today, I am going to show you how. In today’s post I share five energy-boosting snacks full of bone-healthy nutrients, so you can get an afternoon (or anytime) pick-me-up without compromising your bones. Let’s get started on these delicious snacks! What’s In An Energizing, Bone-Building Snack? You’ll see why these are the perfect pick-me-ups. Unlike coffee or candy, they are protein-rich and full of immune-boosting, bone-rejuvenating Vitamin C. They are chock-full of delicious Foundation Foods, and provide lots of nutrients that are proven to build younger, stronger bones. 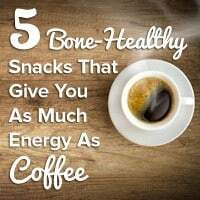 Unlike coffee, these snacks will give you long-lasting energy and are pH-balanced or 100% alkalizing (coffee is acidifying, and even more so with milk, cream, flavor syrup, and sugar added). The key is to have the ingredients on hand ahead of time (or have the snack already made) before the afternoon slump hits. Here are five delectable snacks to give you the boost you need while nourishing your bones. The versatility of plain yogurt is vast. (You can even strain out the whey and make “cheese”!) The probiotics and fermentation process make this dairy product alkalizing and excellent for your bones, and it’s a wonderful way to boost immunity and guard against flu. Sunflower seeds are healthy “brain food” that contain Vitamin E, healthy fats, and protein. Vitamin E doubles as an antioxidant in the body, and relieves inflammation. This amazing vitamin even guards against Alzheimer’s disease. No wonder it energizes you! Pumpkin seeds (also known as pepitas) are a rich source of magnesium, the crucial bone-building mineral that is so often ignored by mainstream medicine with regard to osteoporosis. They also contain trace minerals manganese, copper, and zinc – a vital trio that work to synthesize the crucial antioxidant, Superoxide Dismutase. Shavings of dark chocolate make a very tasty topping for plain yogurt. With its high antioxidant content and trace mineral trio (manganese, copper, and zinc again), dark chocolate is an excellent bone builder, even though it is acidifying. If you have ever seen the liquid on top of plain yogurt, then you’ve seen whey. It’s full of a bone-healthy nutrient called lactoferrin, and is another example of an alkalizing dairy product that is good for your bones. For this snack, you’ll need whey protein powder in your favorite flavor (personally, I like vanilla). To make a smoothie, simply add a few scoops of whey protein powder to about a cup of the milk substitute, such as almond milk. Add some of your favorite fruits or veggies and whirl it in the blender. Strawberries, bananas, carrots, mangoes, and melons are just a few suggestions. Choose any alkalizing fruit and top with walnuts or almonds. Most fruits are alkalizing – some exceptions are cranberries and blueberries. For a complete list of alkalizing and acidifying fruits, refer to the complete food chart in Chapter 9 of the Osteoporosis Reversal Program. Fresh fruit, of course, is full of nutrients and fiber. Walnuts are acidifying, but excellent for bone health; combined with alkalizing fruit, you have a pH-balanced, energy-boosting snack. They are rich in Omega-3 fatty acids, which actually increase calcium absorption and enhance collagen production. In addition, Omega-3 fatty acids boost osteoblast activity. Almonds are one of the few alkalizing nuts. They are rich in calcium and magnesium, which are very important for bone health. They also contain zinc, boron, copper, and silicon. For topping fruit, I prefer raw almonds that are slivered or sliced. This salsa-like dip is wonderful with bone-building celery sticks. It’s also excellent with DIY bone-healthy chips (#5 below). Celery is a rather humble vegetable that often gets overlooked. But it’s very alkalizing and full of Foundation Supplements that build younger bones, like Vitamin K, calcium, Vitamin C, folate, Vitamins B2 and B5, and magnesium. Citrus fruits seem like they would be acidifying, but their effect on the body is actually alkalizing. Grapefruit has been shown to increase bone density, and red grapefruit is rich in bone-building lycopene. Oranges contain flavonoids that account for their beautiful orange color. In addition to keeping inflammation under control, flavonoids act as antioxidants in the body, protecting your bones from oxidative damage. Red, round, alkalizing tomatoes contain lycopene, another plant pigment and antioxidant that is found not only in tomatoes, but also in red fruits like watermelon and grapefruit. Here is how to make this bone-rejuvenating dip. In a large bowl, mix all the ingredients. Refrigerate until ready to serve. Drain juices before serving. These are a delicious chip option that is excellent for building youthful bones and getting an energy boost. And they are much healthier than store-bought chips. In contrast to acidifying white potatoes, sweet potatoes are alkalizing. Their orange color comes from beta-carotene, which is converted into Vitamin A in the body. In addition to being rich in antioxidants, sweet potatoes contain Foundation Supplements like Vitamin C, copper, magnesium, and B6. Fresh beets are sometimes overlooked in favor of the sweetened, pickled variety in a jar. But fresh beets are excellent for bones, and they even reduce stress, thanks to a plant compound called uridine. Their rich, red pigmentation is due to another plant chemical called betalains, which play a role in an important detoxifying enzyme process. Arrange in a single layer on two large pans and bake for 25 minutes, or until chips are dried. Remove from pans to cool and repeat with sweet potato and the rest of the olive oil. Sprinkle with salt if desired. If you have the Densercise™ Epidensity Training System, then you know it comes with a free bonus: the Densercise Eating Guide. What you eat affects how your body responds to exercise. For example, many foods in the Eating Guide are high in antioxidants, because your body produces more free radicals as a byproduct of exercise. Bone Appétit, the Save Our Bones recipe book, also comes with two bonuses that consider the importance of snacks: The 30 Day Meal Planner and Blender Magic. The Planner includes two snacks each day – one that’s 100% alkalizing and one that’s pH-balanced. Blender Magic is one of my favorite additions to the Bone Appétit collection. Blended foods can make excellent afternoon pick-me-ups, and you can prepare them in minutes in your blender. Sweet or savory, your blender can whip up something highly nutritious in a very short amount of time. Snacking on nutritious Foundation Foods is a bone-healthy habit. As you explore the various materials and products we offer here at Save Our Bones, you’ll be amazed at the variety of foods that build your bones, and how snacking is a big part of bone nutrition…and the foods are all so delicious! I was wondering, I’m a vegan. What should i be aware of? There are many vegan Savers, Susanne! Since animal products are not emphasized on the Program, it’s not difficult for vegans to make a few tweaks and successfully follow the Program. I would really like to have the book(s) in printed format. My PC doesn’t do the downloading all that well, and once it’s “hidden” inside the PC I forget all about it! Hey Estelle – you took the words right out of my mouth! In fact I suggested this earlier. I have masses of downloaded articles that have somehow become lost in cyberspace! And hard copy is so much easier to use for reference. There’s such a lot of valuable info on this website that I don’t want to miss any of it. And you’re doing a great service to us all, Save Institute! I am a very picky eater and don’t like the foods you suggest to help my bones. The test I do on my urine says I am acidic. They say there is a pill that helps your urine become more alkaline. 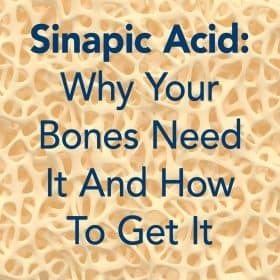 Would this help my bones if I can get my urine test to be more alkaline? Thanks for all your great information. I prefer the exercise system in print and dvd. Would like to get a printed copy of the bone density exercises. Celery is such a lovely vegetable — probably my favorite of the moment. Another great snack: celery stuffed with almond butter. Yum! Please, I would really like to have a printed densercise book which is much more convenient to use and to take along. Thank you again for all you do, Vivian. Printed materials, please! I can’t download large files, and hard copies are much more useable. In the healthy snacks I read ,that patatoes are acid. In the save our bones book and in the internet vegetables and fruit book(vey nice thank you )are patatoes alcalic! The survey asking me about what format that I want educational materials presented in did not mention dvd’ s. That is my preference. Just a friendly reminder to those who have questions and concerns that do not pertain to the subjects covered in this blog post (such as questions about your order, our products, or topics besides the ones covered in this post), please send an e-mail to Customer Support by clicking the Customer Support link at the bottom of this page. In addition, you can use the Search feature at the top of the page to view all the free information that Vivian has written on a particular topic. Thank you! I have sent messages before but never got a response. Please let me know if STRONTIUM is good for the bones. Sorry…posted my comment too soon. I went to the health food store and started using a bone grow “system” which was taking raw calcium during the day and strontium (680mg) at night. Recently I became unsure about how long I should continue with this regimen and started researching strontium. In my research, I found any number of places that suggested taking strontium in this amount was not a good idea. I saw on this site where someone mentioned taking Greencal harvested West Coast of Ireland and Iceland. Where can I research these and purchase them if interested? Welcome, Cathy! Good for you for doing your own bone health research, and for being sure enough in your convictions to stop the Fosamax. Feel free to use the Search feature at the top of the page to peruse the hundreds of free articles on this site! I am new to this site but find it informative and interesting. I had knee replacement surgeries on both knees in the fall of 2012 at which time I was told I have soft bones. I had a hysterectomy when I was 38 (I’m 62 now) and took replacement estrogen only for a short time because I have breast cancer in my family history (maternal grandmother). I am not a milk drinker, have 7 children, breast fed all of them, so for all the reasons listed above, I would assume, I have soft bones. My teeth are strong (I only have 2 cavities) and my gums are healthy, but I have bone loss in my jaw, and have 2 loose bottom teeth. 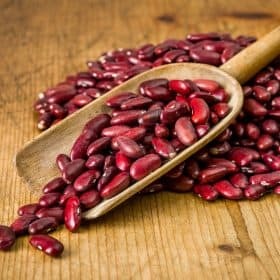 Which beans are alkalizing? I also cannot eat dairy. How do I get enough calcium? Thank you for a reply. In November 2014 I sent money order in amount of $105.95 for Anniversary Sale book print because my computer does not allow me to download. I have awaited receipt of order allowing 6 to 8 weeks for delivery. What can I do to receive order or refund? I await your reply today. Bone Appetit that I purchased were excellent. I am so glad you are learning so much from the Program and Bone Appetit, Marlene! And as I noted to Jean below, you can print out the Weekend Challenges and keep them in a notebook if you like. Wow the SOB community is so diverse in needs and personal levels of bone health. I have an intolerance to dairy so don’t use whey powder. But thank you for providing such a variety of snacks that we can pick and choose what suits us. My husband and I both like nuts and seeds but I prefer almonds for their alkalinity and the pumpkin/sunflower seeds. Still trying to add calories too for my skinny body so 80/20 doesn’t always work for me. Yes, the Osteoporosis Reversal Program works for all sorts of approaches to and levels of bone health! A good tip I learned about eating beets, is to put a sticky note near your toilet saying “you ate beets”! Thank you for the option of printing out these ideas and recipes. This is the first time I’ve been aware of that option, and I very much appreciate it. You are welcome, Jean. You could collect them in a 3-ring binder if you like! I would like to have the exercise manual in book form. I do not always have time to look on computer. I like to look at either a video or have the book in front of me when trying to exercise. Hallo from Judy to Judy Bergsrud [and hopefully, Vivian too] OH YES please I agree with Judy and beg for the Exercise book in Printed form. I find the e-book [as all e-books] almost useless and very annoying without live links to pages or chapters or parts of the body and on a glaring white background. By the time I’ve found a particular exercise [except I’ve now given up] I’ve just about lost the will to live ! I welcome and try to keep pace with, the ‘Weekend Challange’ exercises. Those I can actually DO I print out but would prefer to chooses my own time to look through my Book. A real book book ! plus the a video option to accompany said Book. The Densercise is the companion book to ‘Save Our Bones’ so needs to be available in the same format and the same super large print. I’m all for Prevention, but but maybe a special edition with realistic exercises for the already broken elderly, who have lost height [5″ in my case] and pictures NOT of young fit agile folk who are obviously on the right side of prevention. AND all this time, I did not know that this comment section was here. Otherwise I would have begged for a printed version ages ago AND asked some questions too. Perhaps at the beginning of e-mails, you could mention the ‘comment’ section is at the end ! I will keep an eye out, that’s if I have sight left after wizzing up and down whole books of flashing pages ! by all means supply e-books but with only with the printed option available. OH more comments below ! ah well, I’ll just post this for now. .
. I am 73 with bones broken in 2003 and then 2010. Nothing since and feel that the body works hard to rid itself of toxins, so why put them there in the first place? i would rather have the exercise video that I ordered yesterday in a book.I have the save our bones program in the book and love it. Thank you. I am extremely allergic to MSG and whey protein powder is full of it. MSG is very unhealthy. Go to http://www.truthinlabeling.org and read about MSG and its near identical opposite aspartame. migraine headache at all since we started using it. Thank you Andrea for reading my e-mail. Crete, I am sorry you are going though this difficult situation. Ask your doctor to refer you to an endocrinologist, which is a specialist in bone and mineral metabolism. You should be evaluated for an underlying cause of your multiple fractures! I am so sorry to hear about the fracture, Crete! I wish you a speedy recovery. To enhance fracture healing, it’s important to make sure that sufficient bone and collagen building minerals are available, such as calcium, magnesium, zinc, boron, manganese, and copper. Vitamin K and D3 are also very important, as well as B12 (preferably taken with the rest of the B complex) and Vitamin C. Also, some antioxidants (lycopene and polyphenols) help build new bone. Maintaining an alkaline body pH is also very important. All these recommendations are also applicable to the prevention and reversal of bone loss. again re; recipes. Do not peel or you remove the nutrients. Put a little oil on your hands and try to poke them with a fork. If you are organic you may have worm eggs in the skin. They bake just fine. The obove sweet potato/Bett recipe can be made in the microwave in about 10-15 minutes. Serve fancy with a dollop of sour cream. Suggest that if you are perimenopausal You begin taking 10 mg of Provera a day. This is Depoprovera and I am almost 60 and still fertle! Medicine is not a science, it is an art. 60 years ago women took progesterone, then the pharmacutical companies said no, then they got the patent for Premarin (mare pee) and by way of animal cruelty to the mares are now saying no. Your natural progesterone has bottomed out or is very low. With 10 mg of provera unless you smoke or live in NYC or HK lol you should be fine. Estrogen is the one that is hazardous to your health. With the snacking. Please be aware of the fact that most of us have partials, bridges, and others, please stop with the crunchy snacks. I have spent enough on my teeth to be able to remodel my kitchen. Ground nuts. By the time we are ready to read or buy your book we have outdated you. Many start with calcium leeching from the jaw and teeth. That is the first sign. Go for things that are a bit mushy. Love>>Glenda ps. stir fry, calcium only absorbs in acid so blender drinks that are acidic and have a pill calcium magnesium ground into it and others. Stay away from celery which literally is wood and other crunchies. Your teeth can chip and break. The mouth again is the first indicator as to a loss of calcium. Pregnant women, like my teen mom, had me with the jaw size of a 4-yr-old. Orthodontia, crowns at 19 along with root canals et al. White Scandanavian women are the only ones who are not lactose intolerant. Asians absorb the least amount of calcium. No milk. No soy as the estrogen is a problem. I simply microwave with syran wrap. Drink water from plastic bottles and use my provera. Most women using provera get a natural rise in testosterone, estrodial and estrogen. I am white and I have not begun to wrinkle. What do I have 20 more years? I can also finagle with the progesterone and give myself a period. Have not done that for 3-years. You slough off your uterine lining with a period and have almost no chance of utierine cancer. So I am 60 and have not hit menopause yet but I cannot chew worth a damn. Done. Hi Glenda, What is Provera? Dr. Neil Barnard in his book on healing foods to reduce and get rid of pain suggests women with osteoporosis take progesterone. It is available on the internet however I would be afraid to take hormones. I read your emails all the time and really enjoy and believe in what you are about. I am wondering if you have any advice for me. I have chronic osteitis pubis, which I have had for more than 13 years. 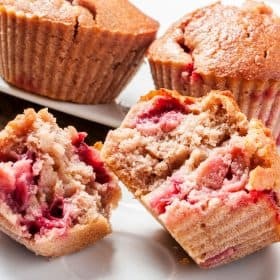 i follow your bone building recipes and foods. I eat extremely well and combine exercise physiology (only exercises for my condition to strengthen my core & glute muscles) plus acupuncture. I have constant flare ups, so a lot of inflammation. To make it worse I fell down stairs 6 months ago which exacerbated the situation. I am 45 years old and am premenopausal, which doesn’t help. I have to wear a sacroiliac belt at the moment until the muscles strengthen. What can you suggest? I would really appreciate any help that you may be able to offer. Thank you Vivian. Jennifer, you might like to peruse the Weekend Challenge exercises and see if there are any that would fit your needs and work the muscles you need help with…with your doctor’s or therapist’s approval, of course!